Measles, Mumps and Rubella (MMR) are the contagious diseases that bring about serious consequences especially among the children below 15 years. That’s the reasons Chief Medical Officer Mr Devendra Nag held a press conference at Jagdalpur to talk about prevention of the diseases. While speaking to the journalist at Jagdalpur in Bastar he told that MMR vaccine is to be administered to the kids below 15 years during the month of August and our team is ready to give them at the schools located in the entire region. He further stated that a team of doctors against 200 kids would be deployed at every school. Thus, 2460 schools children are under the medical supervision and 2, 62,370 kids would be administered across the Bastar district. Well, this blog aims at talking in details about the fatal diseases that our region is ready to combat with. The victim has the symptom like a fever cough and running nose and rash that cover the entire body. Moreover, the patient has red, watery eyes. It can also lead to the ear infections, diarrhoea and infection of the lungs that is called pneumonia. It can also cause fever, headache, muscle aches, tiredness, loss of appetite and swelling in glands under the ears on one or both sides. It is also called German measles. It can lead to a fever sore throat, rash, headache, and eye irritation. Pregnant women are more susceptible, she could either have a miscarriage or a baby could be born with a serious complication. 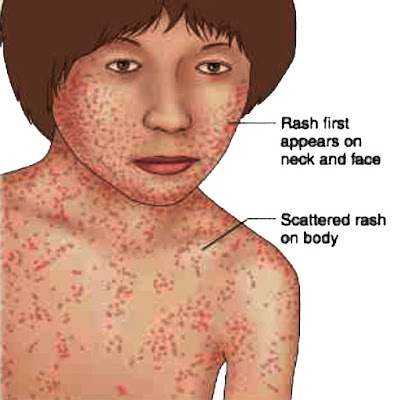 MMR stands for Measles, Mumps and Rubella and name of the vaccination is named after these diseases. Let's check out the doses of it. And the second dose goes 4 to 6 years of age. Should you read my blogs in Hindi. Please click HERE.